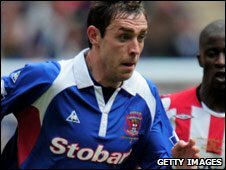 Coventry City have agreed to sign Carlisle United defender Richard Keogh on a three-year deal. The former Republic of Ireland Under-21 captain will join the Sky Blues on 1 July, having passed a medical. Keogh, 23, is manager Aidy Boothroyd's fourth summer signing and will arrive for an undisclosed fee. "Richard is another hungry player who comes here looking to prove himself and that's exactly the type of character we want," said Boothroyd. "He's already got 170 career appearances under his belt, which is a decent level of experience for a young player, and I'm very much looking forward to working with him. "We are pleased with our progress in the transfer market so far this summer and we are looking to make more additions to the squad in the near future." Keogh will join City's other summer recruits Stephen O'Halloran, Roy O'Donovan and the returning Gary McSheffrey when the squad report back for pre-season training.